The first Africans from Spain were known as ladinos, or hispanicized Africans, and were soldiers, servants, settlers, and slaves. They began to arrive in the Americas as early as the 15th century, many as auxiliaries to the Spanish and Portuguese explorers. As Matthew Restall states, “[F]rom the very onset of Spanish activity in the Americas, Africans were present both as voluntary expeditionaries and as involuntary colonists” (Restall 2000:172). Many people of African descent initially saw passage to the New World as a means of bettering their social and economic positions. Landers notes, “[G]iven their numbers and roles in Spanish port cities like Seville, and their generally depressed economic conditions, it is not surprising that both free and enslaved Africans hoped to improve their lots by crossing the Atlantic on the earliest voyages of exploration and conquest” (Landers 1999:9). Those who voluntarily set out on expeditions and became part of armed auxiliaries were more likely than those in unarmed roles to gain their freedom. The African pioneers who set out for the New World contributed greatly to the building and maintenance of colonial societies. Together with the Europeans, they formed a specialized and limited pool of human resources circulating througout the circumCaribbean area. Between 1519 and 1600, 151.6 thousand Africans disembarked on the Spanish American mainland and another 187.7 thousand over the next 50 years. In all, 54% of all enslaved Africans brought to the New World between 1519 and 1700 disembarked in Spanish America (Eltis el at 2001). Africans and their descendants were an integral part of the exploration of Spanish America from the 15th through the 18th centuries. Spanish expeditions within what would become the United States largely covered Florida and the Southwest. These territories were a part of New Spain, an area which also covered Mexico and Central America. The exploration of these lands required people who would not only open up the land, but settle, develop, and secure the land as well. 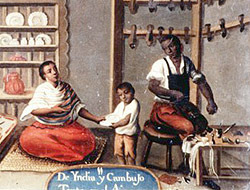 African men and women were part of a number of Spanish expeditions. The Panfilo de Narvaez Expedition of 1528 from Cuba to Florida is one such example. This expedition included Esteban, perhaps the most notable African male to aid in the exploration of North America. The Coronado Expedition of 1540 to Southwestern North America included a free African man who later served as an interpreter and would eventually become a Franciscan friar. The Juan Guerra de Resa Expedition of 1600 included African soldiers, their mulatto wives and children, and Isabel de Olvera, a mulatta woman. These are just three examples of the many expeditions which included Africans and African Americans among their members. The Panfilo de Narvaez Expedition gives an example of how Africans potentially adjusted to life circumstances during the Spanish phase of exploration. The account of Esteban is one example of adaptation and survival in the New World. Esteban, also known as Estevan, Esteven, Estebanico the Black Man, Stephen the Black, and the “Black Mexican,” was born in Azamar, Morocco. He was the first African in Texas and what would become the Western United States. As Juan Flores and others recount, he was one of the four survivors in the ill-fated journey of Panfilo de Narvaez in 1528 from Cuba to the Florida coast (Flores 2004). After spending many years in captivity among Indian tribes, Esteban—the gunbearer, scout, slave, and solider—escaped and joined Cabeza de Vaca and company on a trek across the continent. Not only was Esteban a remarkable survivor, one of the four out of 400 to survive, but it was believed that Esteban was a powerful healer and medicine man. He would later spend four years walking from Florida to Mexico City and would serve as a guide for missionaries. Esteban was familiar with many indigenous villages and was an “interpreter, emissary and diplomat with the natives” (Taylor 1998:28). It is also reported that Esteban had many relationships with indigenous women. He was eventually killed while trying to enter the Zuni town of Hawikuh. Read more about Esteban. Each of these expeditions contributed to encouraging the further exploration of Western North America. These expeditions also opened up the West to people of African descent. As can be seen, these pioneers were essential to the settling, developing and maintenance of towns along the Western frontier. Sixteenth century conquistadors of African and Afro-Hispanic American descent, hereafter referred to as “black conquistadors,” were as much a part of the exploration of the Americas as their Spanish counterparts. Many people of African descent used military service as a means to emancipation and inclusion into Spanish society. As the numbers of expeditions increased and the people within Spanish America began to settle, the need to secure the land and the riches associated with it grew as well. Black conquistadors figured prominently in the securing of these lands. Juan Garrido with Hernan Cortes. As a result of their military successes, some black conquistadors were awarded land grants and special recognition, with Chile being the only country in which black conquistadors received encomiendas. Juan Garrido is one example of a black conquistador who accompanied Ponce de Leon on his Caribbean expeditions as well as Hernan Cortes in Mexico. Garrido, born in West Africa, participated in the conquests of Puerto Rico, Cuba, Guadalupe, Dominica and Florida. In his lifetime he was a resident of Puerto Rico, Mexico City and Cuernavaca and occupied the post of doorkeeper (portero) and crier (pregonero). Eventually, through the probanza or petitionary proof of merit, Juan would be given a house plot but he was never granted a position in the new city of Mexico other than those typically occupied by blacks (Restall 2000:177). Sabastian Toral, black conquistador in the Yucatan, settled down and raised a family. But he, too, had to wait for property and recognition and petitioned the Crown (at least twice) in order not to have to pay tribute. He eventually became a doorkeeper and a guard. Juan Valiente is another example of a black conquistador who fought in Guatemala, Peru and Chile and as a result of his conquest was given an estate, Indian slaves, and an Indian town to pay him tribute. Valiente would go on to marry Juana de Valdeni who may have been an Indian woman or a free black woman. Juan Garcia took a different path. He gained his spoils and returned to Spain, but only after having been a crier, a piper, and master of weights in the New World. The example of these four black conquistadors and the brief synopsis of their conquests and occupations shed light on the social and economic positions available to black conquistadors at the time. People of African descent who were a part of the larger groups of auxiliaries were usually involved in mine labor due to the hope that mines would be found in various parts of Spanish America to finance the colonial venture. Those who belonged to the smaller expedition groups, like the above mentioned men, were stereotypically cast into the position of crier after fighting, a position which included duties such as acting as constable, auctioneer, executioner, piper, master of weights, doorkeeper/gatekeeper. Restall states that these positions were “…clearly seen by Spaniards as an obvious position for a black conquistador to assume after the fight was mostly over in a given region” (2000:191). No matter how great the contribution to a given conquest, there was still little room for social mobility via occupations for African men, even extraordinary males, during the 15th and 16th centuries. As the 17th century came to a close, the racial and ethnic composition of black conquistadors changed. The majority of conquistadors would now be mulattos, free and enslaved, as opposed to their earlier counterparts who were Africans. These mulattos were born in the Caribbean or the Yucatan and most were trained in pardo (mulatto) militia companies. There were also pardos libres (free mulattos) and morenos libres (free blacks) which formed militia companies. Those included within these militias requested that companies have the names pardo or moreno in them, that blacks be allowed to serve as lieutenants and receive the same pay as whites, and that members be allowed to take full advantage of fuero militar or military benefits (Sanchez 1994). Fuero militar would included the right to bear arms, select unit colors, and wear uniforms. Military benefits also allowed for a distinction to be made between militiamen and those enslaved (Sanchez 1994). Distinction not only existed in the military, but within the greater colonial society as well. The 16th century Spanish colonial population was made up of four basic groups; the indigenous Indians, European-born Spaniards or peninsulares, their American born descendants called criollos, and the Africans. By the late 17th century, after nearly two hundred years of Spanish law that permitted and in a sense encouraged manumission, there was a considerably sized free African population and many free African communities throughout the Spanish colonies. There was also considerable intermarriage between the four groups. In 1783 King Charles III of Spain issued cedulas de gracias al sacar- certificates that “cleansed” people of impure blood by providing them with documentation that would allow a person’s racial status to change. For example, a pardo (mulatto) could become a quinteron (one-fifth African blood). These certificates cost money, but for those who could afford the cedulas de gracias al sacar, as their occupations changed so too could their racial status (Taylor 1998:36). Mexican of African Descent as Cobbler. People of African descent were located throughout the castas system depending on who they married or with whom they had relations. Because of the ambiguity associated with definitions of castas and the fluidity of the social system due to networks created in the community (through godparent alliances and confraternities for example), mobility within the system was, unofficially, a possibility. Further research on the castas paintings explore the contrast between what is presented in the actual paintings in terms of rigid physical or visible race, the occupations of the individuals depicted within each painting, and the actual geographical location of each casta (whether people are depicted as living in the city or in rural parts of the colonies) (Carrera 1998). The Castas Paintings were meant to illustrate that this system influenced nearly all aspect of a person’s life including occupations, emancipation procedures, godparent selection and economic and political opportunities available to people of mixed racial heritage or castas.